Calendar Add-in. Add our Events Calendar to your personal calendar, and keep track of our seminars, workshops, webinars, coaching events, and get-togethers! Electronic counseling. We now offer teletherapy for the benefit of clients who prefer to work with us by video or phone. Click the blue "Schedule Me" button to book your first electronic counseling session. Join us Friday evenings in November and December 2016 for Financial Peace University, a program designed to get you and your spouse talking about money. Research demonstrates that couples who communicate about finances have happier, longer marriages than those who don't. Combined with marriage counseling that gets you communicating peacefully, expect your holidays to bring you real peace on earth! As of Jan 1, 2016, we've moved across the walkway to new offices in Suite 105. Nothing changes but the doorway! 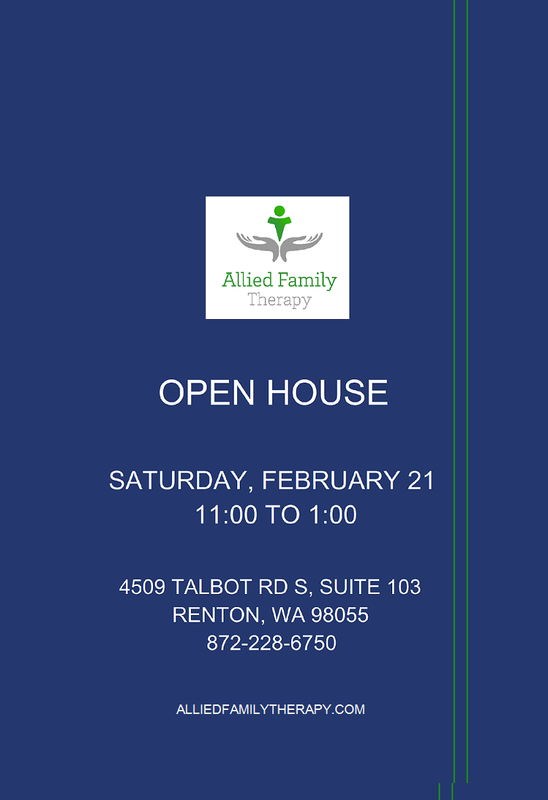 21 February 2015 -- Open House. Open House for clients, neighbors, colleagues, friends, and new friends. Join us for refreshments and tour our new offices, enter drawing for door prizes, exchange business cards, meet our family, our advisors, and co-workers. 1 February 2015 -- Office Opening. We open our new offices in Renton on February 1st. We'll be accepting new clients, and welcoming existing clients, beginning February 2nd.